The competence of professionals and diagnostic capacity within the CARIFORUM Region regarding laboratory testing of Leptospirosis bacteria is being boosted, thanks to the collaborative work of the Caribbean Animal Health Network (CaribVET), the European Union (EU) and the Inter-American Institute for Cooperation on Agriculture (IICA). 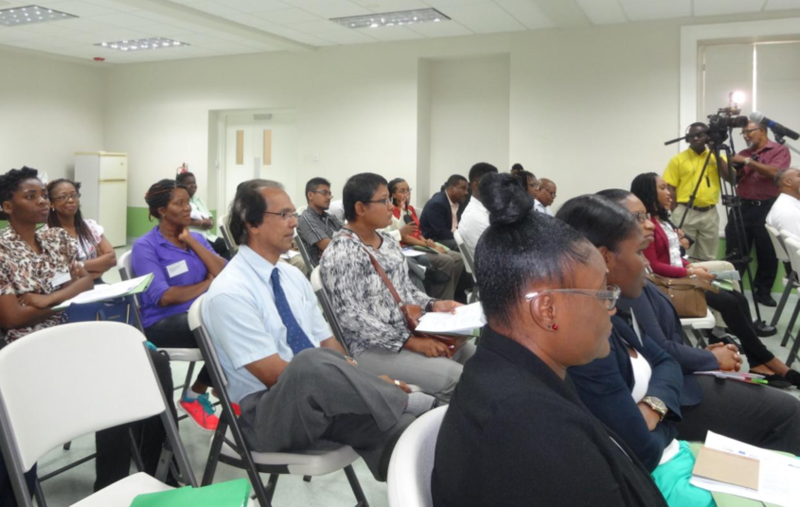 These remarks were made by Mrs Ena Harvey, Head of the Barbados Delegation of IICA, at the opening of a regional training workshop on Leptospirosis Diagnostic Testing, which took place at the Barbados Leptospira Laboratory, 3 to 5 May. The Workshop is one action of the Capacity Building Component of the EU funded Sanitary and Phytosanitary (SPS) Measures Project under the 10th European Development Fund (EDF) Programme for the CARIFORUM Region, which is being implemented by IICA, along with its partner agencies. Dr Alexandra Vokaty, Chairperson of the CaribVET Veterinary Public Health Working Group remarked that “the CaribVET group on Leptospirosis has started to undertake training of a core group of personnel from national laboratories in the Caribbean in the use of the gold standard diagnostic technique with special reference to the Leptospira Microscopic Agglutination Technique (LMAT)”. The participants will also be trained in the correct methodology of the interpretation of test results, and will be advised on the suggested methods for implementation of diagnostic testing mechanisms in their respective countries. Once trained, the laboratory technicians will be able to train other personnel in their countries. The training is expected to provide valuable epidemiological information that will contribute towards the prevention and control of Leptospirosis in animals and people in each country within the CARIFORUM Region and in so doing, will also contribute to safeguarding human health and food safety within the Region. Mrs Harvey highlighted that Leptospirosis presents an occupational hazard for people who work with the land, including farmers and field workers. The bacterial disease is spread through contact with fresh water, wet or dampened soil, or vegetation that has been soiled by urine from an infected animal. Climate Change with its changing environmental trends, and extreme weather patterns, she said, may also become a factor in Leptospirosis outbreaks. Mrs Harvey emphasised that “in order for the CARIFORUM Region to meet the requirements of international trade, critical competences must exist in the areas of surveillance, diagnostics, risk analysis, emergency response capability, and quarantine measures. Under the SPS Project, and with partners such as CaribVET, IICA is implementing a set of integrated actions which establishes a solid groundwork for a world class regional Agricultural Health and Food Safety System”. “The investigations used for the diagnosis of leptospirosis are expensive and require specialised laboratories or reference laboratories where trained personnel perform these tests. Most regional laboratories have not developed these specialised techniques, and samples are often sent to overseas laboratories for diagnosis. Currently, the Leptospira Laboratory in Barbados is the only regional lab that has the capacity to perform the gold-standard test. Capacity building of regional laboratories in Leptospirosis diagnosis presents an opportunity for the Region to reduce the costs that are currently incurred in the centralisation of the performance of these tests and improve the efficiency of the testing process,” stated Dr Marquita Gittens-St Hilaire, Director of the Leptospira Laboratory in Barbados and member of the CaribVET Leptospirosis group. The Leptospirosis Training Workshop is just one activity being implemented by CaribVET under the EU-funded SPS Project. The Project seeks to enhance international market access and trade opportunities for the Region by improving the legislative framework, coordination mechanisms and technical capacity in the areas of animal health, plant health, food safety and fisheries. At the Workshop, Ms Katja Svensson, EU Programme Officer — Regional Integration & Trade, reiterated the EU’s commitment to the continued development of the CARIFORUM Region and expressed confidence that the components and activities of this Training Workshop, and of the wider SPS Project would contribute to the beneficial integration of the Region into the international economy.